In this paper learn how RSA Group shortened their FP&A process by 4 months. With a 300-year heritage, RSA Group is one of the world’s leading insurance groups. The company, which has over 20,000 employees in its core markets of the U.K., Scandinavia, and Canada, focuses on general insurance and has the capability to write business across the globe. 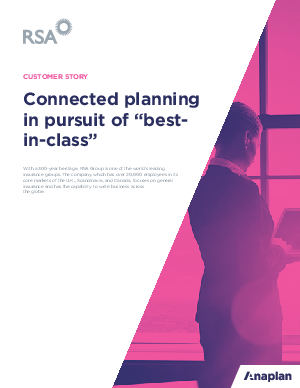 fists down on his desk and said, “Surely, this can be easier; surely, we can ind a solution to make this a less intense process.” It was that outburst of frustration that triggered Andrew and his team to look for different solutions to their inancial planning needs and ultimately led them to the Anaplan platform.